Burma's ever-repeating cycle of ethnic conflicts, tenuous ceasefires and resumed hostilities have left the country in a quagmire. But after decades of armed insurgencies, it appears economic pressures, in part due to geographical happenchance, could offer the region's best hope of achieving peace and prosperity. Both India and China—boasting almost half the world's population between them—stand to profit enormously from progress in Burma's tumultuous border regions. The most direct route between the industrial zones in China’s center-east to India is via Burma and Bangladesh, thus avoiding the inhospitable Himalayas and unstable Tibet. Despite bombastic rhetoric from India about China's “string of pearls” ambitions in the Bay of Bengal, the true picture is in fact far more complex. In 2008, China emerged as the largest trading partner of India and the nations have also attempted to extend their bilateral strategic and military relations. Trade between the two goliaths has risen steadily over recent years and peaked at US $73.9 billion in 2011. It thus appears the Asian superpowers are well on the way to achieving the target of $100 billion of bilateral trade by 2015 set out when Chinese Prime Minister Wen Jiabao met his Indian counterpart Manmohan Singh in New Delhi in December 2010. Little wonder that officials in Naypyidaw are fostering Burma's image as as the “strategic nexus” between China and India and Southeast Asia—potentially boasting unbeatable access to the world's three fastest-growing markets. Understandably, financiers from all over the globe are licking their lips at the prospect of an open Burma and pushing hard for stability in the region. “It doesn't happen every day that a country of 60 million people in the most dynamic region of the world is suddenly open for business,” Singapore consultant Hans Vriens told The Economist earlier this month. Of course, it would be naïve to assume India's only interest is simply trade with China. Burma has massive natural gas reserves in its western province of Arakan and nearby waters—estimated at more than 30 trillion cubic feet. In October, India promised Burma $500 million credit for oil and gas exploration, border trade and infrastructure projects—including roads, inland waterways and ports—when the Indian Prime Minister met Burmese President Thein Sein in New Delhi. Chief amongst these is the construction of the $120 million Sittwe deep-sea port in Arakan State which should be operational by June 2013. The facility will allow cargo ships from India’s landlocked Mizoram State to navigate the Kaladan River and connect with Southeast Asia. “We have an important relationship with Myanmar. And we have an important relationship with China. There is no competition,” Indian External Affairs Ministry spokesman Vishnu Prakash said at the time, playing down any economic rivalry with Beijing. And there are already substantial trade links between Burma and India, with Indian companies investing heavily in its western neighbor's energy sector. The latest $500 million of credit comes on top of $300 million of extended credit in 2010. India was the second largest receiver of Burmese exports in 2010 with 20.8 percent, while China was third at 12.9 percent. Thailand remains Burma's closest trading partner by receiving 38.3 percent of exports, but is already facing up to the additional competition caused by Burma's looming international rebirth. But exploitation of Burma's natural resources remains constrained by infrastructure—particularly road and rail routes—which also remains a major stumbling block for increased trade through the region. The expense of shipping from China's eastern ports via the Straits of Malacca has led Beijing to investigate myriad alternatives. Thein Sein was reportedly asked if the Chinese navy could have access to Burmese ports in the Bay of Bengal during a visit to Beijing in June last year, prompting predictable remonstrations from New Delhi. There is also the possibility of resurrecting the old Trans-Asia Railway idea—first suggested back in the 1960s—to increase trade in the region. Indian Railways is studying a proposal to construct a high-speed rail link from New Delhi via Manipur through Burma to Kunming in southwest Yunnan Province, reported The Times of India last April. @ tocharian - Honesty, modesty, and bravery? What kind of bizarro world do you live in? Within last week, didn't this journal publish articles of burmese attacking Shan and Karen after signing cease fire agreement? Probably an overdose of honesty, huh? I have a strong feeling that the ongoing conflict in Kachin State is very much due to Chinese, who wanted to push ahead with the Myit Sone Dam project, which Kachins are so rightly against so the Chinese in their Chinese ways put pressure on the war-mongers generals to subdue or annihilate the Kachins. Those commanding generals only dare to give orders to their slavish rank and file soldiers. 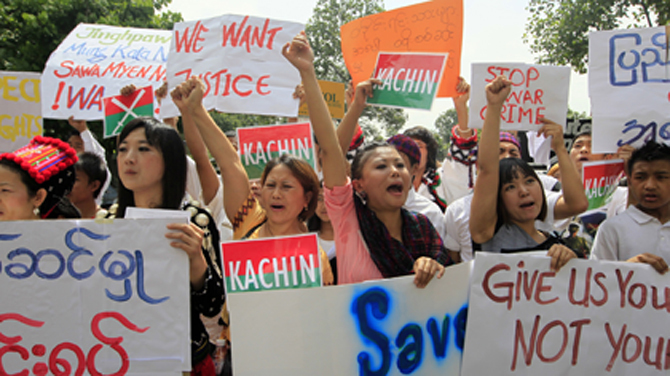 They themselves do not have the damned guts to go Kachin states personally. Shame on them! It's better to be free and poor and have control of your own destiny than become slaves of China or India. Will all the people and nations actively drooling and salivating please remember human lives are still not yet safe!!!! More abuses in last year than ever. Nor is the by-election campaign at all fair yet. MONEY is NOT more important than HUMAN LIVES, and BURMA DOES NOT BELONG TO THE BUSINESS INTERESTS, NEIGHBOURS WHO DID NOT ASSIST THE PEOPLE, OR THE MILITARY IN NEW CLOTHES! "The Developed Nations" have rampant consumerism of half a centuries now like a runaway train with unsolvable debt crisis merely held off. China, India and South-East Asia will be biggest target for consumerism, people robbing banks to buy 4mm TV's, etc. Burma needs to comply. The military thinks it is neat idea, so do the "Democratic Forces". Of course if Burma and the region is depleted by 30 years' time there is always the moon. All enlightened people are desperately keen for it. For "Prosperity". Including Aung San Suu Kyi. What do the 40 odd millions of Burmese think? Do they feel like bailing out the decadent world for consumerism by joining them dropping their millenium old culture and traditions? Rather, the dissenters WILL be eliminated!! !